Good Friday evening saw me at pitchside with good friend “Burnley” Dave, who was looking resplendent in his new claret and blue trainers! We saw a penalty, a superb free-kick, a glorious moon-rise, a glaring miss, a sin-bin and most importantly of all, a cracking game of football! 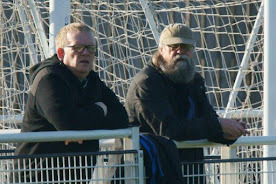 The game was a Notts Senior League division one fixture between hosts Basford Utd CFC and their visitors, Bridgford Utd. Not the most glamourous of fixtures on paper, but what a feast of football the 40+ spectators were witness to! The first 25 minutes or so saw both teams playing some entertaining stuff, but the game really exploded into life with 29 played. 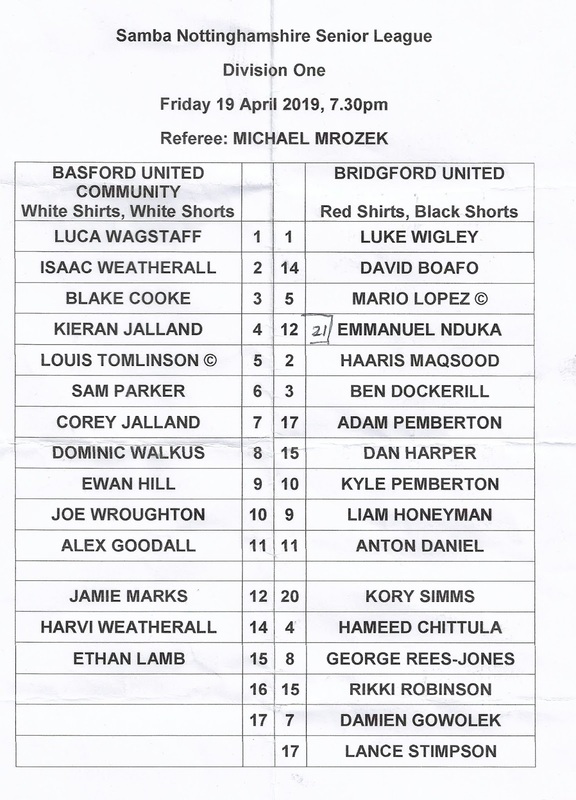 Basford were awarded a free-kick some 20 yards from goal, and COREY JALLAND curled the ball over the wall into the top corner of the goal, giving ‘keeper Luke Wigley no chance. 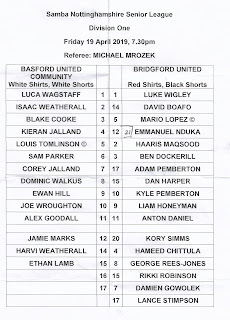 The lead lasted barely 60 seconds though – KYLE PEMBERTON receiving the ball in the box and slotting past Luca Wagstaff to give Bridgford parity. The visitors must have thought they’d netted again a minute later, but Wagstaff dived to his left to palm the ball off the line, tipping it around the post and out for a corner. I reckon it’s one of the best saves I’ve ever seen and brought a very appreciative round of applause from all those present. A real stunner – my words don’t do it justice! Tough on the visitors, and made even worse a few seconds later! Basford played the ball long out of defence and were awarded a penalty when a player was upended in the box. I couldn’t see who was fouled, but ALEX GOODHALL wasn’t too bothered and stepped up to fire home from the spot. From being a finger-tip away from going 2-1 down, Basford now found themselves 2-1 up! The second half was only a few minutes old when we witnessed one of the misses of the season! A fierce drive from the corner of the box saw the ball crash off the underside of the Basford crossbar before bouncing up nicely for Liam Honeyman to nod into an empty net – although he didn’t – he directed his headed wide of the upright! Bridgford then took the game to their hosts and looked as if they were not out of the game, even at 3-1 down. It was then a surprise to everyone when Basford netted again just before the hour mark, GOODHALL completing a splendid triple! The not so dynamic duo! !